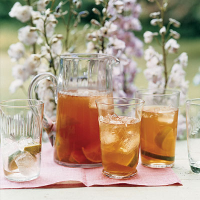 If you fancy something cool, a chilled glass of lime-flavoured iced tea is the perfect drink to accompany a slice of cake on a hot summer afternoon. Pour 1 litre boiling water into a heatproof jug with both tea bags and infuse for 3-5 minutes. Remove and discard the tea bags then leave to cool. Pour the cooled tea into a serving jug containing the lime juice, lime slices and sugar and stir until the sugar has completely dissolved. Add the ice cubes and serve.